The Bahrain Youth Society for Human Rights stated today that during the year 2013 the Bahraini Courts issued imprisonment verdicts against 651 citizens based on security charges related to the protests that kicked off on 14 February 2011. The BYSHR confirmed that he Bahraini Courts had issued verdicts in 95 cases, and the charge “assembling and riot” was the most common in 2013. The BYSHR explained that 10 citizens were sentenced with life imprisonment, and 153 citizens were imprisoned with 15 years. The BYSHR indicated that 120 citizens were sentenced with 10 years and 219 citizens were sentenced with 3 to 5 years in prison, while 149 citizens were sentenced with 1 month to 2 years in prison. Mr Mohammed Al-Maskati – president of the BYSHR – stated that the Bahraini Courts used freedom restricting laws to punish the protestors. Mr Al-Maskati explained that since 14 February 2011 the Bahraini Authorities have been arresting and trialling citizens with charges related to freedom of opinion and expression. Protesters carrying Bahraini flags and photos of Shia scholar Isa Qassim march during an anti-government rally organised by main opposition group Al Wefaq in Budaiya, west of Manama, yesterday. DUBAI: Bahrain accused Iran’s Revolutionary Guards yesterday of providing opposition militants with explosives training in order to carry out attacks in the Gulf kingdom, announcing that it had arrested five suspects. Bahrain is ruled by a Sunni Muslim dynasty but has a population that is majority Shia. The government crushed a mostly Shia-led uprising in 2011 and has long accused predominantly Shiite Iran of meddling in its affairs. On Monday, Bahraini authorities said they had seized a boat smuggling explosives made in Iran and Syria into the country. Since the 2011 uprising, which called for democratic reforms, demonstrations have regularly been held in Shia villages around the capital, often sparking clashes with security forces. At least 89 people have been killed in Bahrain since the protests began, according to the International Federation for Human Rights. Several bomb attacks have taken place in recent months, including one that targeted a Sunni mosque close to the royal court in July but caused no casualties. 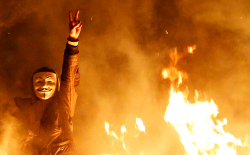 Tensions escalated over the weekend as authorities interrogated top Shia opposition leader Ali Salman. 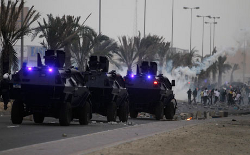 Security forces in Bahrain have attacked on a Shia Mosque and Hussainia in Sanabis village on Sunday evening, The Shia Post reported. 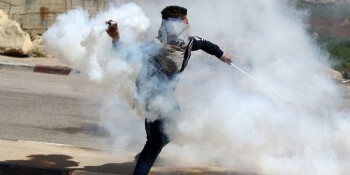 The extensive and persistent use of tear gas against civilians by Bahrain’s security forces since over two years was unprecedented in the 100-year history of its use throughout the world. The Bahraini government has resorted to the policy of “collective punishment” of the nation by regular crack downs on the people who peacefully protest against government’s discriminatory policies. Bahrainis have been staging demonstrations since mid-February 2011, calling for political reforms and a constitutional monarchy, a demand that later changed to an outright call for the ouster of the ruling Al Khalifa family following the regime’s brutal crackdown on popular protests. Scores have been killed, many of them under torture while in custody, and thousands more detained since the popular uprising began in the Persian Gulf state.